I think part of the reason he meets the horrible fate that he does was the symmetry. Here he is, a guy who claimed to be the Chesapeake Ripper and was the grand pretender to the throne. For him to both become the Chesapeake Ripper and the Chesapeake Ripper’s victim felt like there was a certain poetry that Hannibal would appreciate. We see in episode five, Abel Gideon really goes out of his way to save Hannibal Lecter from Will Graham, but more importantly, save Will Graham from Will Graham by preventing Will from taking a life out of malice. We see that there is a humanity to him and an understanding and even a sympathy for Will Graham and his plight. So as Beverly Katz has carved the path for all of those who believe Will Graham in any capacity, he had to go down the same chute. 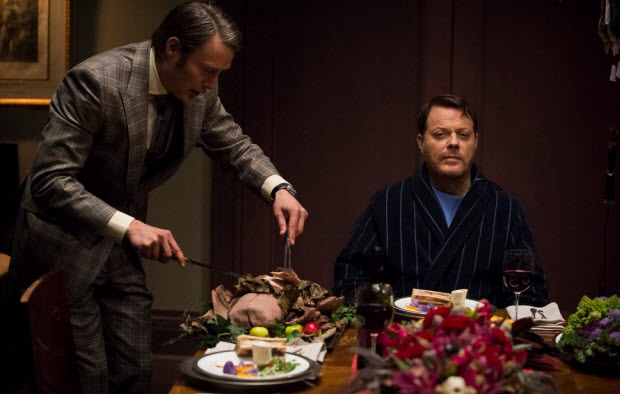 It appeared that Jack might obtain some evidence about Hannibal when he finally paid attention to Will’s theories: “If the Ripper is killing, you can bet Hannibal Lecter is having a dinner party. You and I probably sipped wine while swallowing the people who who we were trying to give justice, Jack.” Jack took some food from one of Hannibal’s dinner parties to be tested. Hannibal outsmarted Jack that night as the beef really was wagyu beef (which really is delicious). While there was not conclusive evidence against Hannibal, there was evidence showing that both the Chesapeake Ripper and the alleged copycat who continued after Will’s incarceration were the same killer, proving it could not be Will. I did not expect to see Will go free until much later in the season. (Can I still wear my Free Will Graham t-shirt?) There was also a piece of rare tree bark which led to the discovery of Miriam Lass, the young FBI agent who figured out Hannibal’s secret in a first season flash back. Surprisingly she is still alive, but is missing an arm. From the interspersed scenes with Hannibal, I suspect that the discovery of Miriam was a planned move on his part and there is not enough of her mind left after all these years to incriminate him. Coincidentally, Anna Chlumsky returns to Hannibal the same weekend she also returns to television on a new season of Veep. Seeing Hannibal seduce and drug Alana was as chilling as the scenes with Gideon. While her fate (so far) is not as terrible, we have far more invested in her character. 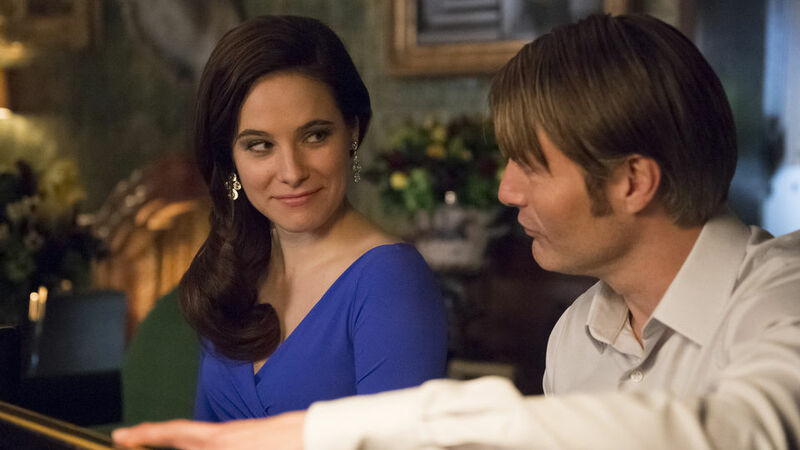 For the purposes of this episode, sleeping with Alana provided an alibi for Hannibal capturing Gideon. Television sedatives work wonderfully, with the victim being guaranteed to neither wake up or realize anything was unusual during the night. Next we presumably will see the consequences of a newly freed Will finding that while Jack might now be open to his theories, Alana is almost literally sleeping with the devil. Seeing Hannibal wink at Chilton was enough to suggest he may be doomed, but there would also be some justice in keeping him alive to see Hannibal’s downfall. There has to be someone left to begin treatment of Hannibal once he takes Will’s place in the hospital for the criminally insane. Besides, unlike Miriam Lass and Beverly Katz, Chilton is not likely to allow himself to be alone with Hannibal Lecter. 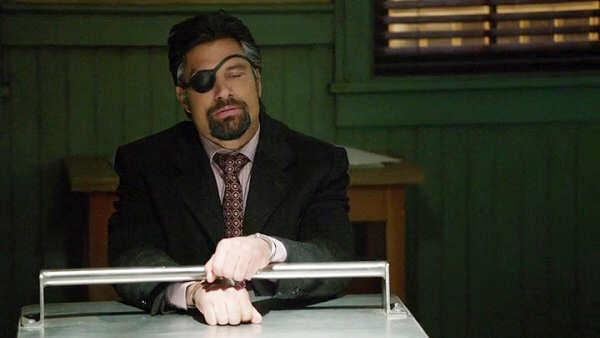 Arrow had yet another strong episode with Deathstroke. It was a key episode for Thea, who is now angry at Oliver after Slade revealed that Oliver was keeping secret the fact that Malcolm Merlyn (John Barrowman) was really her father. I had expected the secret was going to be about Oliver on the island and now being the Arrow. We never saw how Slade also knew about Malcolm Merlyn, but it does not contradict anything we have seen for him to have discovered this on his own. Poor Oliver, now being blamed by Thea for keeping the same secret which he was now become estranged from his mother over. Speaking of secrets, if she knew the full story, Thea would also have good reason to be angry at Oliver for not warning anyone about how dangerous Slade was. If Oliver had said something when he showed up in their home, Thea might not have gotten into the car with him. Having released Thea, it no longer appears that Slade has any interest in keeping his actions a secret. It seems like after this week, most of the secrets are out in the open. 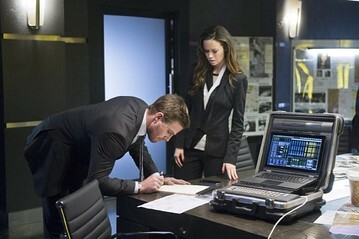 Not only has Oliver lost Thea, he has also lost control over his company as we learned that Isabel Rochev (Summer Glau), who he had only planned to make CEO pro tempore, was also working with Slade.This is all part of Slade’s plan to take away everything from Oliver. The episode ended with yet another cliff hanger. While he didn’t tell the secret I had expected him to tell to Thea, Slade did visit Laurel at the end to tell her that Oliver Queen is the Arrow. Most likely this will change things, especially as her father’s freedom now depends upon him revealing the Arrow’s identity, but there is no guarantee she will believe Slade. After all, as I pointed out last week, she couldn’t even tell that her own sister was the Black Canary when sitting right next to her. Although common in the comics for a mask to be sufficient to hide one’s identity, the mask did very little to hide her face. If Laurel had encountered Sara at the beach wearing large sunglasses, which would cover as much of her face as the mask, would she be unable to recognize her? Just how much alcohol and drugs did that girl consume? 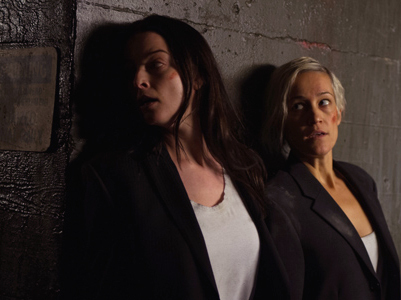 Continuum season three finally aired in the United States on Syfy with resolution of last season’s cliff hanger, answering some questions and raising new ones. Alec has gone back in time a week in hopes of saving Emily, creating a new timeline. I feel like I’m in yet another time jump, being three weeks ahead of where the show is in the United States by downloading the episodes after airing on Showcase. I will limit spoilers to the episode which aired in the United States and will avoid mentioning events of subsequent episodes which have aired. Minute By Minute began with action scenes with Kiera (Rachel Nichols) and Garza working together to escape, but things got far more complicated with the timeline collapsing and the Freelancers sending Kiera (who has now joined up with them) to the new timeline created by Alec going back into the past. The episode deals with some of the central questions of the series regarding time travel but hardly settles anything. If traveling in time creates a new timeline, does this mean that Kiera cannot ever return to the time she left? Perhaps the fact that the Freelancers could send her to the same timeline Alec had created suggests some ability to move between timelines and presents a mechanism by which Kiera could ultimately return to both the same time and timeline she came from. Possibly actions by people from the future might give some insight into how time travel works if we can assume that they really understood it. Now we know why Kagame made sure he died on the day he was born, understanding the consequences should he ever meet himself. I think the real key is that future Alec Sadler, having his memories of what happened in the past, must have had some master plan in sending both Liber8 and Kiera back in time. Presumably he had some goals based upon changing the conditions he created. However, will this really change the future he lives in, or just create a second and hopefully better timeline? There are already some key changes in the new timeline with Escher dead, although now any death might not be permanent if there is the possibility of the show moving to yet another timeline. We no longer know Emily’s fate. Can Alec succeed in saving her, or must she be allowed to die to save the future, like Edith Keeler in the classic Star Trek episode, City on the Edge of Forever? The final scene from last season with Carlos deciding to join Julian will probably never occur. Hopefully changing timelines doesn’t turn into an easy cosmic reset switch. 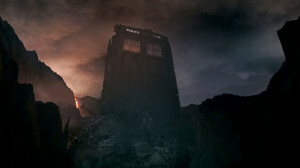 “THE DOCTOR: Changing time is tricky. It’s a bit like a detective story: so as long there isn’t an actual body, you’ve got a certain amount of wiggle room – for instance, if the body has, rather conveniently, been burned on a boat in Utah. “Here’s the thing: I can change the future so long as the future has not already been established as part of my own past. I can’t rescue Amy and Rory because I already know that I didn’t. The cable network on Friday announced that its adaptation of the Brad Pitt and Bruce Willis feature film has been picked up to series with a 13-episode order for a January 2015 premiere. Nikita’s Aaron Stanford and Suits’ Amanda Schull star in the drama based on Universal Pictures’ Terry Gilliam film. In Plain Sight’s Natalie Chaidez serves as showrunner on the drama about a time traveler from the post-apocalyptic future who appears in the present day on a mission to locate and eradicate the source of a deadly plague that will eventually decimate the human race. Syfy has picked up 12 episodes of The Wil Wheaton Project (working title), which the actor-blogger has dubbed “sort of like Talk Soup for geeks.” The half-hour show, hosted by Wheaton, will allow the geek hero to dissect the week’s biggest stories in sci-pop culture with the witty commentary that has made him a social media star. In his own words, Wheaton describes the show as a “weekly roundup of the things I love on television and on the Internet, with commentary and jokes, and the occasional visit from interesting people who make those things happen.” In a blog post, Wheaton gives a charming behind-the-scenes account of the year-long process that led to the series being greenlit; his enthusiasm for genre entertainment and insider status serve his audience well. ”We discovered that nobody was doing a show like this that was just focused on the genre shows that nerds like us love, and we decided that we’d make that show,” he writes. 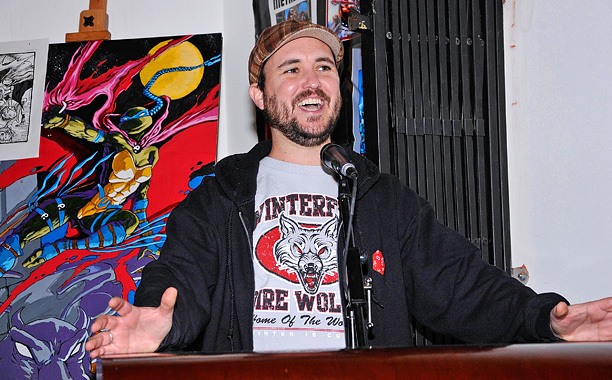 The Wil Wheaton Project premieres May 27 at 10 p.m. ET on Syfy. The Americans remain on the trail of the murders of the other spy couple in Behind The Red Door. We learned why this is personal for Claudia, who might have let some information slip out while dating. There’s historical references to Reagan’s actions in Nicaragua. There’s also both discussion of the heroin overdose of John Belushi and a young agent using poisoned heroin to kill the Congressional aide to eliminate the risk of stolen material leading back to her. The strongest scene of the episode might have been the aftermath of last week’s visit from Elizabeth to Martha. Elizabeth couldn’t get past Martha’s talk of how wild Clark was in bed and wound up regretting forcing Philip to remain in the Clark role. Initially it seemed that what Martha found wild was the usual for Elizabeth, but then Phillip went further when Elizabeth seemed disappointed. 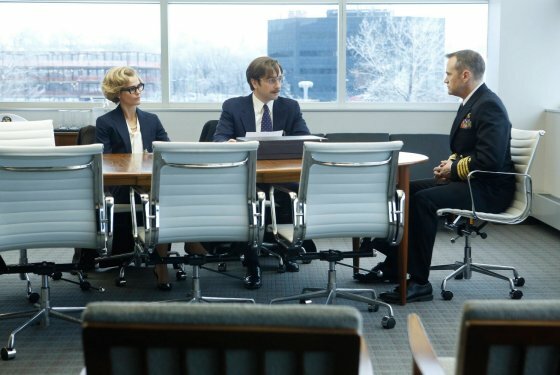 Meanwhile Oleg is making matters far more complicated for Stan and Nina, trying to turn Stan into a double agent. This week we saw primitive 1980’s technology, a dot matrix printer, used to print out reports. Next week we will see if Nina can fool 1980’s lie detector technology. CBS’ The Big Bang Theory is teaming with Lucasfilm for an epic Star Wars episode timed to Star Wars Day, The Hollywood Reporter has learned. 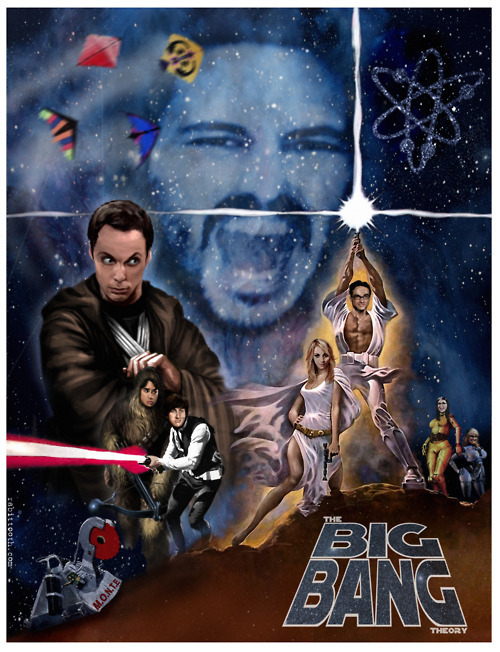 In “The Proton Transmogrification” — the episode set to air May 1 and timed to the annual May 4 Star Wars Day — the gang gets together to celebrate the annual geek holiday, while Sheldon (Jim Parsons) is guided by visions of his childhood idol and mentor, Professor Proton (Emmy winner Bob Newhart), who appears to the socially challenged genius as his own Jedi master. For those not in the know, Star Wars Day is recognized every year on May 4, with the traditional celebratory greeting being “May the fourth be with you” — a play on Star Wars’ famed “May the Force be with you” line. Fans across the globe celebrate the film franchise with screenings and special events. For the episode, the CBS comedy teamed with a group of special effects technicians from Lucasfilm’s Industrial Light & Magic to re-create Dagobah — the remote world of swamps and forest that served as a refuge for Yoda during his exile — and provide props for the episode, including a light saber. Lucasfilm experts consulted on the episode and visited the Big Bang Theory set to oversee the production, with the final touches completed at its San Francisco headquarters. How I Met Your Mother was a remarkable sitcom. It was the best ensemble show of young people in New York despite multiple attempts at this theme following the end of Friends. It did a far better job of telling a story by jumping around in time like Lost than any of the more explicit genre attempts to follow Lost. Unfortunately, instead of being, wait for it, legendary, the finale was a huge disappointment to most fans. If this was Community, the series would have ended in the Darkest Timeline.Fortunately the shock of Tracy’s death was made bearable by advance warnings in fan theories which turned out to be true. We knew that Carter Bays and Craig Thomas would have some twist planned considering how the series began, but hoped they had something tricker planned than having the Mother die leaving Ted free to wind up with Aunt Robin. Upon reading that they had filmed the ending with the children during the second season so that they wouldn’t appear too old when the series ended, I feared that this is how they would end the show, but still held out hope that they understood the changes in their own show and would come up for a better ending. During the second season, when the scene was filmed, this certainly made sense. For years the show centered around Ted and Robin and during that time I did suspect that the twist at the end of the pilot was a diversion and that the two really did wind up together, even if someone else was the mother of Ted’s children. 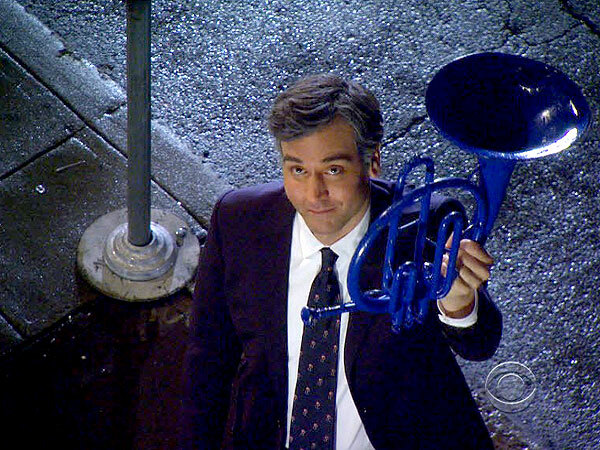 The final scene, with Ted going over to Robin’s apartment carrying the Blue French Horn, with Robin’s dogs in the window, was a recreation of a scene from the pilot when Ted returned to Robin’s apartment after failing to kiss her goodnight the first time. (He also missed the signs and failed to kiss her whens he returned–but just rewatch it on Netflix if you don’t remember the details). However, over the course of nine years the characters changed. If they had stayed the same, it would have been fine if they used this ending. It is also fine that the people changed, but that required a different ending for the show. By the end, Ted and Robin were no longer Ross and Rachel. Sure there were plenty of clues in the final episodes as Robin had moments when she said Ted was the one she should have wound up with while Ted finally looked ready to move on. 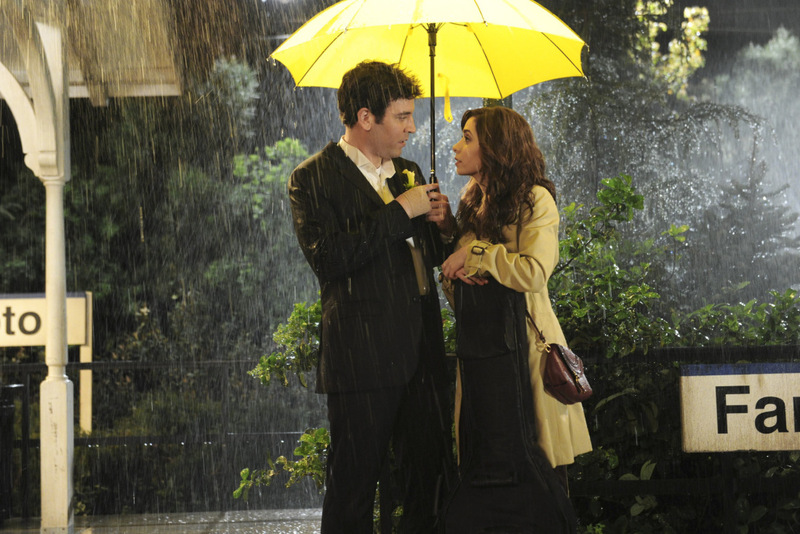 However the final season was more about the couples of Ted/Tracy and Barney/Robin. The Mother was no longer just a MacGuffin to propel the story of Ted and Robin. Thomas and Bays did too good a job of making the fans fall in love with Tracy (whose name we didn’t learn until the final episode), and see that she was really the perfect girl for Ted. They also made us accept and welcome the implausible marriage of Barney and Robin. If the show ended a year or more earlier, as expected, and an unknown woman, or perhaps Victoria, had married Ted but died after having their children, we could have accepted that as a plausible ending and might have been happy that Ted wound up with Robin. Killing off Tracy was a totally different matter. Thomas and Bays should have realized that the evolution in their characters required a different ending than had been planned back in the second season. Besides being the wrong ending for where the characters had evolved to, the timing for the show now felt wrong. We spent the entire final season seeing the weekend when Robin and Barney got married, and then their marriage fell apart in a quick sequence in the final moments of the finale (which was a huge clue as to where they were going). They left us wanting to see so much more of Tracy and Ted but all too quickly she became sick, and that was that. She pretty much died off screen just as she spent most of her life. If they were going to have her die, she at least deserved a longer exit. It was as if Love Story was all about Ryan O’Neil and past girl friends and then Ali MacGraw appeared in the final five minutes and stole the movie. Being television, an ending is not necessarily the absolute end. I had thought earlier in the week that if this was the ending they originally filmed, the smarter thing would have been to film a new ending which was consistent with where the show was this season, and then add the original ending as an extra on the season DVD. Instead the went with the wrong ending but reportedly they cut a happier ending to add as a DVD extra. 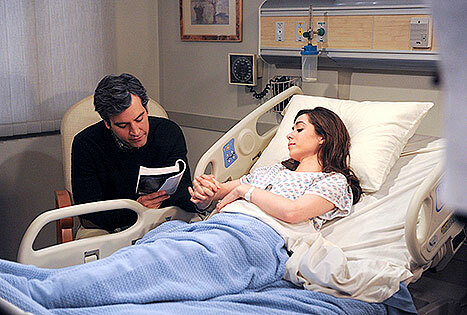 There is also a spin off of the series planned, but I suspect the ending to HIMYM will always haunt Thomas and Bays as fans will now fear that the new series might turn out to be How I Killed Your Dad. Posted in Science Fiction, Television. Tags: 12 Monkeys, Amanda Schull, Arrow, Black Canary, Bryan Fuller, Doctor Who, Hannibal, How I Met Your Dad, How I Met Your Mother, Jim Parsons, John Barrowman, Lost, Rachel Nichols, Science Fiction, Star Trek, Star Wars, Steven Moffat, Summer Glau, The Americans, The Big Bang Theory, The Time of the Doctor, The Wil Wheaton Project, Wil Wheaton. RSS feed for comments on this post.. TrackBack URL.